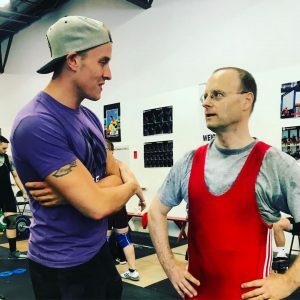 I’m a beginner athlete who’s picking up and loving Olympic Weightlifting, a hobby I found at Crossfit Amoskeag. This blog series documents my journey that started just a few years ago. My name is Joe Chinnici and I’m 48 years old. 2 years ago I started working out at Crossfit Amoskeag (CFA) after spending too many years on the couch, and it is one of the best decisions I ever made. I was not an athlete as a young man. I loved playing basketball in my driveway, soccer on rec teams, and golf for fun but honestly, I was awful at all of them. For a while I tried running and I kept telling myself I was having fun. In my 30’s, I tried the YMCA for a little bit – even pretending I was lifting weights. I then found CrossFit Amoskeag. 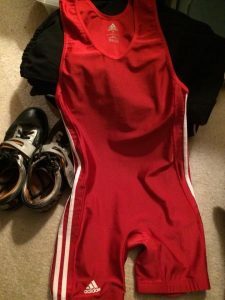 Joe’s first singlet and oly lifting shoes. so much fun deadlifting, squatting, and benching in the 5am class. But all the powerlifting meets looked intimidating on Facebook and I just couldn’t hit the Submit button. Then I came across a local Olympic Weightlifting meet during the summer of 2017. It helped that it was a “First Timers” meet (I have since learned any newbie can start at any local event). So I did it. I hit the Submit button. I soon learned that I would also need a USA Weightlifting membership and a singlet. That’s it – I was ready to roll. The meet went great. I was so nervous but did not throw up (goal achieved!) and I went 4 for 6 setting some PRs. Having an official USA Weightlifting total was a great feeling. I was in shock that fellow CFA members came to support me though, I shouldn’t have been. 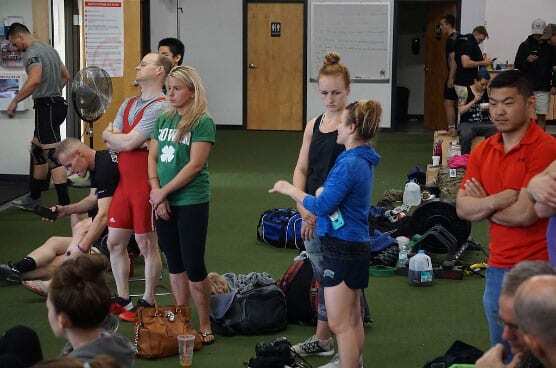 They are awesome people and Crossfit Amoskeag seems to attract them. I’m wondering what’s next, before me feels endless possibility. Turns out that he was referring to the Nike American Open Series by USA Weightlifting. It’s a national event that gives amateurs a bigger stage to compete on. Unlike the local events, you do need to qualify. A few weeks later I ran into AOS on the internet and he was right. So I decided that the qualifying total of 140kg (308lbs) – for my age and weight class- would be my new goal. 29kg (64lbs) is not a lot to gain right? “Soon-to-be-Coach” Taylor and some of the gang that came to support me. Wrong. Yes, I’m newer to weightlifting and increases will come faster than someone who has been doing it for a while but for me, that 29kg (64lbs), turned out to be a lot. The meet was just a couple of months away so I decided to prepare this time by sprinkling in extra training in month 1 and completely focus on Olympic lifting for month 2. I have to admit that it was very hard at first to know that the 5am class was going on with Tiffanie and/or Taylor and I wasn’t with them. But once I started, I was just fine. Not only are the coaches great but the 5am crew is fun! I focused on my weaknesses which is everything so I had plenty to cover in the month. Training went well but the total I was shooting for was seemingly out of reach. I thought to myself fine, I’ll do my best and try for AOS another time.